Berkhamsted Theatre Company production of Evita. Nicholas Priest as Che, Lauren Shepherd as Eva Peron. You will have to be quick if you want tickets for one of the hottest shows in town. Evita opens at The Court Theatre in Tring in October but two of the six performances are already sold out. 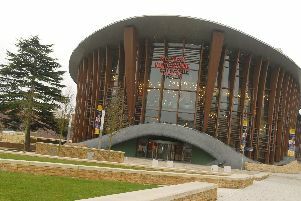 The Andrew Lloyd Webber and Tim Rice smash hit show is being performed by Berkhamsted Theatre Company and follows on from their successful sellout production Sister Act last year. Evita tells the story of Eva Peron, second wife of Juan Peron, who, along with her husband, became one of the most prominent political leaders of the last century. Celebrating the life of a woman who begins as a quasi-prostitute, married a powerful man, and inspires the idolatry of the masses by spending enormous sums on herself, Evita follows Eva’s life from her teenage years through to her early death from cancer aged 33. The musical score is regarded as one of the best ever written and includes instantly recognisable hits like Oh What A Circus, Another Suitcase in Another Hall and Don’t Cry For Me Argentina, and the show is filled with dances including tangos, pasa dobles and similar Latin flavours. Evita is one of the West End and Broadway’s most enduringly popular shows and is a suitably iconic choice for Berkhamsted Theatre Company’s 90th anniversary year. Founded in 1926, the company has a long history of bringing high quality amateur productions to the stage, showcasing the talent of local performers. The show is directed by David Rhys, with Peter Dodsworth as music director. Evita is on at 7.30pm from Tuesday, October 4, and tickets are still available for that performance through to Thursday, October 6, as well as the 2.30pm matinee performance on Saturday, October 8. Tickets are £17.50, available online at www.courttheatre.co.uk or call 07543 560478.